Does Your Computer Need a Fresh Start? If your PC is sluggish, crashing, or generally misbehaving, chances are it could benefit from a reformat, a "clean install" of the system to get it back to factory specs. No worries: when it comes to reformats, nobody does it better than PC Liferaft. Over the years, we've done so many that we've lost count...but it's probably in the thousands. Can your computer be "disinfected" rather than reformatted? Sometimes yes, sometimes no, but based on your individual circumstances we may recommend you play it safe. Once your computer is infected with spyware, worms, or other malware, the only way to be certain that it's clean is to start fresh. 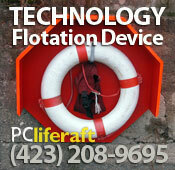 Most important of all, PC Liferaft can both guarantee that your computer is clean and help you keep it that way. Of course, not every computer needs a reformat. Call us and let us help you be sure that you'll be practicing safe computing both today and tomorrow. Roughly half the computers we see are infected with some sort of malware (viruses, worms, spyware, etc.). They may slow the system or cause endless pop-up ads, but what's worse is that you may never see any adverse effects at all. Why, you might ask, would that be worse? Imagine that a stealthy bit of software is running quietly in the background on your computer, listening for patterns of keystrokes that look like credit card or bank account numbers, then sending those numbers to criminals for resale on the black market? Fortunately, like most criminal types malware tends to focus its energies on the unwary and unprepared. If you follow safe computing practices, chances are you can avoid becoming a victim. Feel free to call us at (423) 208-9695 or e-mail to support@pcliferaft.com if you have questions or concerns. We can't say it enough: the computer is expendable, but the data it contains--pictures, tax returns, important school or work documents--is not. If your computer dies, right now, how much do you stand to lose? Backing up your important files is kind of like flossing your teeth: we honestly intend to do it, but don't get around to it quite as often as we'd planned. You can run the best security software in the world and still get infected if you click carelessly. Not keeping Windows computers updated with the latest security patches from Microsoft is a leading cause of infection. A good antivirus is similar to a flu shot for your computer. Having an up-to-date antivirus application doesn't mean you can't be infected, but it's a crucial way to minimize the chances. It's a simple truth: the more you install on your computer, the more chances for problems and slowdowns. It doesn't help that most computers today come with dozens of unnecessary programs pre-installed, but there are literally thousands more available on the Internet. At some point the clutter will begin to have a serious effect on your computer's performance. We're not saying you shouldn't install software that you need; just be aware that just as in life, too much of a good thing can be a bad thing. Install only what you need and no more. Most software will try to store your documents somewhere under the MY DOCUMENTS folder. This is a good thing. The desktop of your computer (the "main screen" you see after it starts up, before you start any applications) is called that because it's just like the physical top of a desk: a place meant to hold just those things you are working on that is all too easily cluttered up with other things. Most computers come new from the store with a variety of software CDs or DVDs, most or all of which are already installed. Don't just mix those CDs with the dozens of others you already have. It's midnight, and you can't figure out how to format multiple columns in Microsoft Word. Is there any hope? You can find the answers to many of your own computing questions through search engines such as Google. Type in the key words of your question or problem, always including the application and version you're using, and scan the results. For example, you might type "Word 2007 columns" to see how to use columns in Microsoft Word. Is everything you find helpful or even accurate? No, but if you keep sifting you'll probably find the solution you need.